When it comes to fashion in Bollywood, Ranveer Singh has always been a very good example of fashion which is 'out there.' His clothes are jazzy, bold, very bright and colorful - and they make a statement: Ranveer Singh is not scared to experiment or go all out. As he continued promotions for his upcoming movie 'Gully Boy' releasing on 14th February 2019, which also stars Alia Bhatt in a lead role, he has been donning various ensembles for it. His recent outfit, however, has been garnering more attention that usual. Dressed in Manish Arora, with 'Gully Boy' written on the sleeve, Ranveer Singh dons a light mint green colour jacket that is covered in faux-fur. 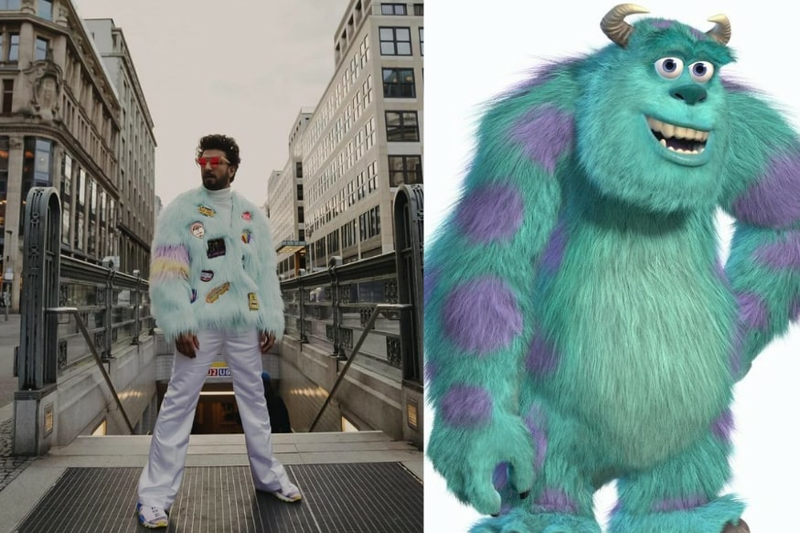 Twitter however, seems to have found this jacket very similar to someone elses fashion - Sullivan from Monsters Inc. Remember when the large blue 'monster' giant, Sully, was your favorite as a child? That's what Twitter thinks Ranveer Singh's jacket looks like. And the similarities are rather uncanny.